Tobias Buckell turns 40 today, and in his honor, I've compiled a set of my Locus reviews of his short fiction; and I've also resurrected this review that I did for my old blog back in the day, of his second novel. 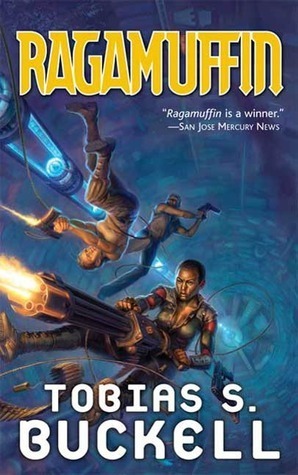 Ragamuffin is Tobias S. Buckell's second novel, and it is a direct sequel to his first, Crystal Rain. However it does not seem at first a sequel, as the action begins on Pitt's Cross, as a mysterious woman named Nashara escapes the human reservation there. Indeed, we learn a lot about the larger universe of Buckell's future, stuff only hinted at in Crystal Rain. Humans are generally kept in near or literal slavery by a variety of powerful alien races, all apparently under the control of the Satraps, trilobite-like aliens who use mind control on their subjects. The Satraps (a bit like Walter Jon Williams' Shan, rulers of the Praxis) greatly restrict technological development, and humans are a particular offender in this sphere. Three human worlds, at least, are isolated behind closed wormholes: Earth, Nashara's home planet of Chimson, and New Anegada (the Nanagada of Crystal Rain). Humans in the Satrapy are controlled by a human group called Hongguo, who police tech advancement and create mind-controlled slaves using Satrapy equipment. Nashara herself is a "Ragamuffin", one of an isolated group of space pirates or independent traders, depending on point of view -- but she is also a special creation -- a clone who, along with her sisters, has had her brain (or some interface equipment to it) seeded with, in essence, a virus that might allow copies of her to take over ships controlled by agents of the Satrapy. Meanwhile, as they say, back on Nanagada, a brief period of peace for the heroes of Crystal Rain ends with the return of the nasty aliens called the Teotl, who are worshipped as gods by an Aztec-derived faction on the planet, complete with human sacrifice. But these Teotl want to talk to John, and to Pepper, both of them very long-lived and artificially enhanced people who were trapped on Nanagada when the wormhole closed. It seems the wormhole has been reopened, and the Teotl are fleeing other aliens -- the Satraps, basically, I think -- who also want to exterminate THEM. Perhaps humans and the Teotl can make common cause, despite complete mistrust? Perhaps they NEED to! I really enjoyed the book. There are a couple of faults -- on occasion the prose gets a bit careless, a bit rushed. And the ending seemed to come just a bit too quickly -- though of course it's not a final ending, there are more books coming in the series! But it was great fun to read, and I find this future a really enjoyable space operatic future -- it pushes a lot of my buttons. The action is exciting -- the bad guys are bad but not quite cartoons -- the good guys are ambiguous and make mistakes -- the SFnal ideas are fun (if not for the most part all that original) -- and I'm really looking forward to upcoming books.